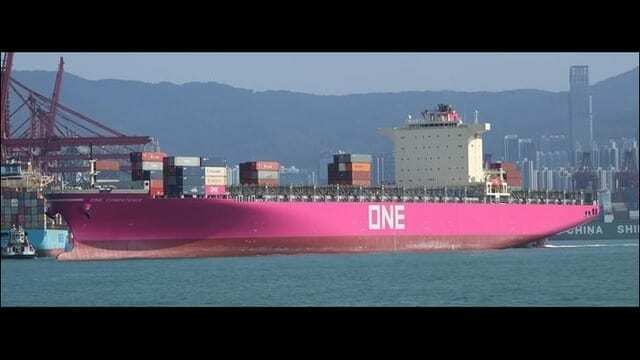 A cherry blossom-colored container ship that’s a feast for the eyes will arrive at the Port of Oakland on Monday morning, Port officials said. Called the ONE Competence, the 1,036-foot-long ship is the newly branded symbol of Japan’s recently consolidated container shipping lines, according to the Port. The ship is scheduled to arrive at Oakland’s TraPac marine terminal at 7 a.m.
“It will be a glorious sight,” Port of Oakland Maritime Director John Driscoll said in a statement. Port officials said the ONE Competence is part of the Ocean Network Express, or ONE. They said the shipping line began service in April following the merger of Japan’s three legacy carriers: K Line, MOL and NYK. The ONE line is one of the largest shipping lines by volume at the Port of Oakland. Port officials said the ONE Competence is one of the first ships with a magenta hull. They said the color represents a cherry blossom tree, which is a symbol of spring in Japan. ONE says it plans to brand more of its 240 vessels with magenta. Port officials said the ONE Competence can carry more than 8,000 20-foot containers. and will depart for Hong Kong on Tuesday.